Even after you've made the decision to opt for an Intel or an AMD processor, however, you still aren't out of the woods: Within each company's chip lineup sit a number of different families of CPUs. And you'll find plenty of options within each of these product families that run the gamut of specifications and features. These details give each chip its speed, cost, and name-but you'll run into trouble if you start trying to analyze a processor's potential based on these three characteristics alone. It's unwise to assume that a processor's stated frequency, or the speed at which the CPU executes its instructions, is a reliable guide to its speed versus competing chips. While that assumption might turn out to be true in some cases, a chip's actual architecture can torpedo it. De­­pending on the make and model, a "slower," or lower-frequency multicore CPU can beat out the general performance of a seemingly faster processor that's been split into fewer cores--a four-core CPU versus a dual-core CPU, to put it simply. Also, processors that seem to indicate superiority by their naming conventions can be anything but: It all de­­pends on how and when they were created, not on their labels. And that's just the beginning of the sources of confusion. How does automatic overclocking play a role in today's conventional CPUs? How does the price-to-performance ratio play out on seemingly more expensive Intel chips versus AMD's less pricey designs? The questions can be as numerous as they are confusing for anyone unfamiliar with processor architectures. But that's okay: We've taken eight classic examples--four each from the Intel and AMD lineups--and run them through our bevy of WorldBench 6 tests to deliver a guide you can use to understand your options, and to help you pick your next processor. We discuss the processors in order, from speediest to slowest, as decided by their WorldBench 6 benchmark scores. For a summary of our findings, click on the thumbnail at upper left here to see our full chart. Processors aren't limited to PCs, so we also take a look at CPUs for smartphones and tablets; that chart is on the third page of this article, which includes a brief glossary of processor terms, plus discussions of upcoming chip technologies and the use of server chips as an alternative to the standard chips covered here. Whoosh! This category leader is so fast, it'll sprout wings and fly. At $1465, the 3.33GHz Core i7-980X (with automatic overclocking to 3.6GHz) is Intel's flagship offering in consumer processors. It's the first desktop-grade CPU with six physical cores, but hy­­perthreading yields 12 virtualized ones. The six cores share 12MB of integrated L3 cache. The end result is a measurable performance boost for optimized applications--and a score of 147 on our WorldBench 6 tests. A 32-nanometer design, the 980X is fully compatible with existing X58-chipset motherboards running an LGA 1366 socket. X58-based motherboards use Intel's quickpath interconnect (QPI) architecture. QPI replaces the front­side bus de­­sign of the now antiquated Core 2 chips, for faster (and greater) bandwidth for routing communications between the motherboard, system components, and the CPU. Intel splits its mainstream desktop and mobile CPU offerings into three sections: The Core i7, Core i5, and Core i3 lines, representing, respectively, high-end, midrange, and entry-level products. That doesn't always mean that a Core i5 chip will be slower than a Core i7, however, as you'll see later. Nor does a Core i7 always have four physical cores. 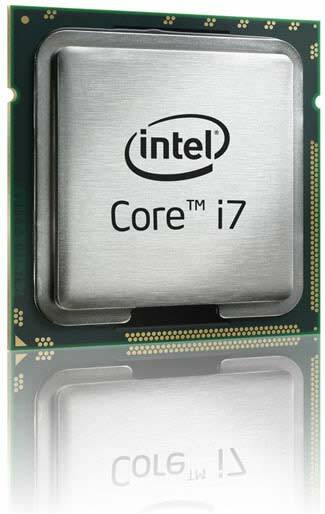 Intel's mobile i7 line defaults to two cores unless the chip has a QM or XM extension. A significant price drop with a minor performance loss against Intel's top-line CPU makes this 45-nanometer, quad-core model an excellent buy. Intel's 2.93GHz (with automatic overclocking to 3.6GHz) Core i7-870 processor earns second place in our rankings. 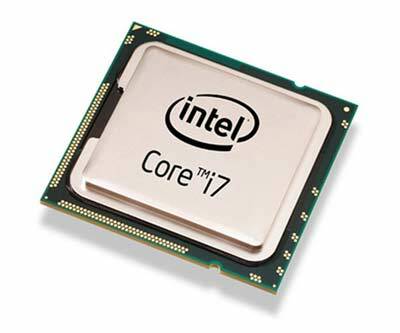 The differences between this $767 processor and the Core i7-980X, though important, result in only a 14 percent decrease in performance from that of the Core i7-980X. The i7-870 drops its internal L3 cache to 8MB. In addition, it carries a 45-nanometer designation (the size of the space between transistors). The smaller this number, the smaller and more numerous the transistors that can be packed onto a processor. Also, this midrange CPU eschews Intel's quickpath interconnect in favor of a direct media interface (DMI). You won't notice that change as much as you might the switch to a dual-channel memory controller, which limits you to four memory slots on your motherboard instead of six. AMD's first-ever six-core desktop CPU beats all of the company's other offerings, but are its advantages strong enough to justify an upgrade? You decide. 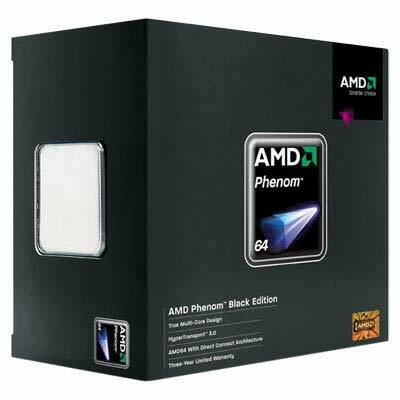 AMD enters the performance game in third place with its brand-new, six-core, 3.2GHz Phenom II X6 1090T processor. Code-named "Thuban," this $373, 45-nanometer CPU can hit speeds of up to 3.6GHz as a result of Turbo Core, the AMD equivalent of Intel's automatic overclocking technology (which is called Turbo Boost). The X6 1090T's 6MB L3 cache is half that of Intel's six-core chip, and it takes a performance hit of 20 percent compared with Intel's Core i7-980X. The X6 1090T also lacks an answer for hyperthreading, a critical technological component of Intel's top-shelf CPU lineups. Performance gaps aside, the X6 1090T wins the compatibility race against Intel by a mile. You can drop this CPU into any existing motherboard with AM3 or AM2+ sockets (after a BIOS upgrade). The combination of a simple upgrade path and the CPU's super-low price of $373 makes for a great alternative to upgrading your existing motherboard and memory, if you just want to reap the benefits of a new, up-to-date processor. Confusion lurks within Intel's Core processor lineup. Case in point: The Core i3-540 beats the general performance of the otherwise higher-class Core i5-750! As mentioned earlier, naming conventions don't always translate into measurable performance improvements. 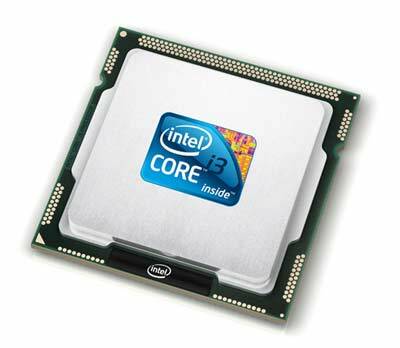 Intel's Core i3-540 is a 3.06GHz dual-core CPU, and a member of the company's Clarkdale line of chips. Released four months after Lynnfield (the family of the Core i7-870), Clarkdale is based on a 32-nanometer production process, versus Lynnfield's 45-nanometer design. The Core i3-540 is really geared for users who aren't enthusiasts--not only does it yield formidable dual-core performance, but it also comes with a GPU core that is packed right alongside the CPU. This sandwich of performance and integrated graphics could cost you a new motherboard, though, because the widely used P55 chipset doesn't support the Core i3-540's GPU core. Look to Q57, H55, or H57 chipsets instead.